A classroom session to go over the basics plus revision in detail to ensure you become totally confident with operating and communicating on the radio whilst flying. We have 'state of the art' computerised training/audio systems which mean we can conduct practical exercises in the classroom so that participants can put the theory into practice. You will take your final exam on exactly the same systems that you learn on - and we have our own 'in-house' CAA approved Examiner so you won't need to go off to a major airfield with all the eppaulettes just to gain your licence. We have put together a number of exercises designed to cover all the scenarios a pilot is likely to face when flying in the local area or taking part in a fly out or cross country navigation. Each exercise will include a 'pre-flight' brief, simulated flight in which the student will contact ATC units along the route and a full de-brief. Request a transit through controlled airspace such as the Class D Brize Norton Zone. Request a MATZ penetration & transit. Select and request the appropriate en-route service outside of controlled airspace. Departure & Arrival procedures at an aerodrome with an Air Traffic Control service. Departure & Arrival procedures at an aerodrome with a Flight Information Service Officer service. The Radio Aids and Navigation Tutor (RANT) system is approved by the National Air Traffic Service (NATS) for teaching and examination to gain a Flight Radio Telephony Operator's Licence (FRTOL) which allows a pilot to legally operate a radio while in flight. All members are required to gain a FRTOL as soon as possible after (or even before) passing a General Skills Test to obtain a Private Pilots Licence. 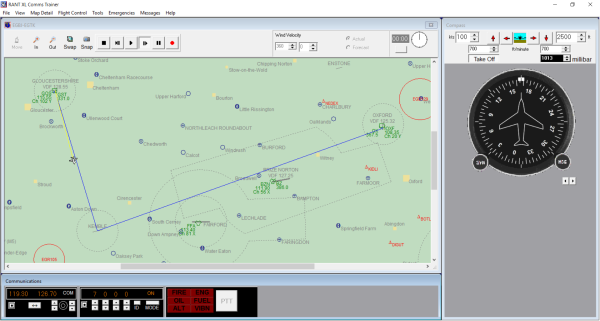 The system runs across 2 computers in separate rooms (this is a requirement for the exam) and shows the position of an aircraft on a moving map [the aircraft position is controlled by the Instructor or Examiner so all the student needs to think about is the correct radio calls]. Audio is transferred via aircraft style headsets so that the training environment correctly mimics radio operation in flight and the Instructor/Examiner can set up various problems (engine fire, downed aircraft etc) for the student to react to. We have four extra headsets in the training room to allow other students to listen in to the practical training. This facilitates discussion on what was right or wrong with particular calls or situations and allows us to work with up to five people in one session. All of our aircraft are now transponder equipped so its important that students and members are now conversant with using these units. The RANT system features a transponder as part of the instrumentation and it is used in the radio training - for members who got their radio licence in the past we offer transponder refresher training. This is the easy way to unlock vast areas of airspace so ensure that you know how to make the most of it. On site examinations are available for the CAA approved Flight Radio Telephony Operator's Licence (FRTOL). This licence can accompany any grade of pilot licence (NPPL, EASA LAPL, PPL etc) and allows the pilot to operate an aircraft radio station. The examination is in two parts. There is a multiple choice written paper which should be completed, and passed, prior to taking the practical exam which is conducted using our computer-based RANT training system. Practice sessions, with one of our Instructors, can be held to ensure you are up to speed before taking the test with our own CAA approved Examiner. These tests will normally be taken on the same day (though this is not a requirement) and have costs of £30.00 for each written paper and £90.00 for a practical exam (hopefully you'll only need one of each). We also offer exam facilities for students from other schools - you will need an assessment with one of our Instructors before we commit you to an exam just to make sure you're up to the required standard.